This one is just a nitpick, but I think it touches on a broader design issue. Problem: Proton Pack cooldown causes dead gameplay: a few seconds where the player just has nothing to do. Solution: Allow players to change weapon types during cooldown. When the Proton Pack gets too hot, it needs to vent before it can be fired again. This is the reload mechanic of Ghostbusters. A manual venting shuts down the pack for a second, while an overheat-forced venting shuts down the pack for 3-4 seconds. During this time, the player has very little agency over the game, since they can’t shoot. My instinct during these lulls in the action was to attempt to switch my proton pack to a different mode, but I had to wait until the pack cooled down before I could change its settings. This made me feel disconnected from the game, reminded me that I wasn’t really a Ghostbuster, just mashing buttons on a plastic controller. Allowing the player to switch modes during cooldown seems like a natural way to keep them connected to the game, as well as encouraging players to look at situations strategically and use a variety of weapons to overcome their foes. Cooldowns become a welcome opportunity to switch tactics, rather than an annoyance that interrupts the firefight. The design principle here is that the player should always have something to do. This is why you see avatars in World of Warcraft jumping around when they’re running from place to place. It’s an immediate and responsive way to interact with the game. During a boring moment, it reminds the player that they have agency. 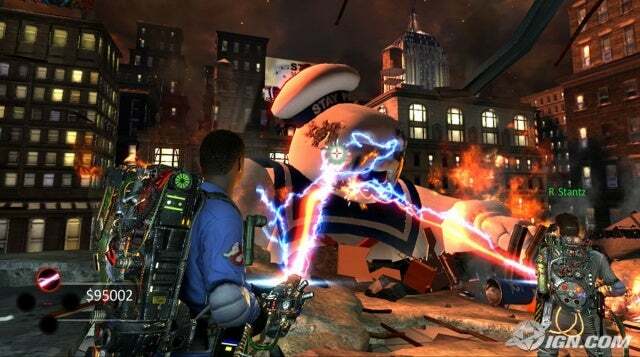 The boring moments in Ghostbusters are only 2-3 seconds long, but that’s still enough to break up the gameplay flow. It’s the same reason I honk the horn when driving video game cars, or bounce the head of the King of All Cosmos around the screen during Katamari Damacy’s loading screens. Call it a short attention span, but I want to have something to interact with. Even if there was just a button that made a light on the proton pack light up, I know I’d be playing with it while I waited for my pack to cool down.